The day of truth is fast approaching. Will Comet ISON’s sungrazing ways spark it to brilliance or break it to bits? How bright will the comet become? Studying the latest images from NASA’s STEREO Ahead sun-watching spacecraft, it’s obvious that ISON remains healthy and intact. The most recent pictures taken from the ground confirm that no major breakup has occurred. Assuming that ISON doesn’t crumble apart on Nov. 28, when it passes just 730,000 miles (1.2 million km) from the sun, it could brighten to -4 magnitude or better in the hours leading up to and after the moment of perihelion at 12:24:57 p.m. CST (18:24:57 UT). This beautiful photo of Comet ISON was taken from a mountaintop observatory with a 300mm lens by Juan Carlos Casado of Spain on Nov. 24, 2013. Casado “stacked” or composited four photos to enhance the brightness of the comet against twilight. Click to enlarge. For comparison, the planet Venus hovers around -4 magnitude and is routinely visible visible with the naked eye in broad daylight if you know exactly where to look. For the sake of establishing a baseline, let’s imagine that ISON will match Venus in magnitude during its crack-the-whip fling around the sun. 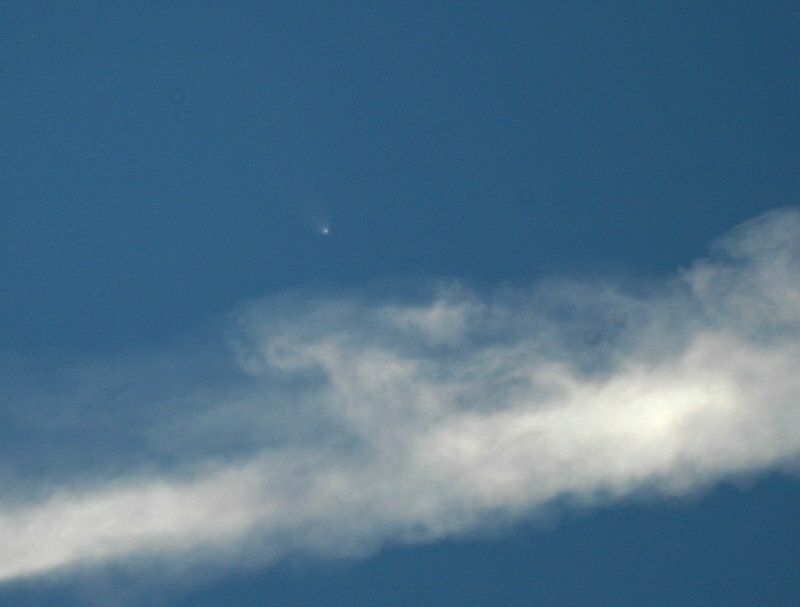 Naturally, this would put the comet within range of naked eye visibility smack in the middle of the day. Well, maybe. ISON presents us with a little problem. While it may grow bright enough to view in daylight, it will be very close to the sun on perihelion day. Not only will it be difficult to tease from the solar glare, but with the sun only a degree or two away, there’s a real danger you could damage your eyes if you stray too close. During the early morning hours of the 28th, ISON will lie approximately 2.5 degrees from the sun’s limb or edge. At the time of perihelion that separation narrows to less than 1/2 degree or one solar diameter. This is likely when the comet will shine brightest, but with the sun so close, it will be next to impossible to spot it with naked eye or binoculars at that time. Matter of fact, don’t even try – it’s not worth the risk of damaging your retinas. An expert observer with a carefully-aimed telescope might pick it up, but must use extreme caution that sunlight not enter the field of view. Come sunset, the distance widens again to a somewhat more comfortable 2.5 degrees. Once, when following Venus as a crescent through inferior conjunction, I dared track it within 2.5 degrees of the sun. THAT was almost too close for comfort. I had to avert my vision from a brilliant wedge of internally reflected sunlight along one side of the view and wear sunglasses to temper the brilliance of the “safe zone” where Venus appeared.. Red and polarizing filters can help reduce glare and increase contrast for near-sun viewing of comets and planets. In mid-January 2007, Comet C/2006 P1 McNaught had a similar close brush with the sun and peaked around magnitude -5. For several days around perihelion on Jan. 12 it was plainly visible with the naked eye in broad daylight. I spotted it 5.6 degrees from the sun at magnitude -3.5 (twice as faint as Venus) at 10 a.m. on Jan. 13 and 5 degrees from the sun the following day when I estimated its magnitude at -4.5. While close, 5 degrees is a much more comfortable distance for comet and inner planet viewing. Whether naked eye, binocular or telescope, the favorite method for finding Comet McNaught in 2007 remains the best for Comet ISON in 2013. Block out the sun by placing something with a crisp edge in its way. Power poles, street lights (finally a good use for them), buildings, roof gables, church steeples and even clouds make ideal sun filters. They effectively remove the sun and allow you to look as close as is safe. Safety is critical here – never look directly at the sun. The damage to your retina will be swift and painless. No comet is worth losing your precious sense of sight. As Earth rotates, the sun slowly moves across the sky. When using binoculars, if you start to see a bright reflection from approaching sunlight in the field of view, shift your position and re-cover the sun. I’ve been asked if you can simply hold an appropriate solar filter over your eye to dim the sun. Yes you can, but the filter will also completely block your view of the much, much fainter comet. Use the filter instead to dim the sun so you can hunt nearby for the comet. Since ISON will be 2.5 degrees from the sun in the early morning and again just before sunset, those might be the best times to find it. Compared to the hour or two around perihelion, the glare will be less though ISON will likely be a little fainter. You can use the diagram above, suitable for mid-northern latitudes, to know in what direction from the sun to look for the comet. If ISON becomes at least as bright as Venus and your sky is deep blue and haze-free, you might just see it on Thursday before sitting down to that Thanksgiving turkey dinner. But of course much depends upon the comet. Don’t fret if it’s cloudy. Head over to the Solar and Heliospheric (SOHO) website. There you’ll have a ringside seat Nov. 27-30 as Comet ISON makes its death-defying turn around the sun. Thereafter it will appear risk-free in the morning sky with what we hope will be a beautiful tail. Thanks for the continuing updates Bob! It’s great seeing UT with an ‘in-house’ amateur posting updated info. for this amazing apparition… Very cool! Thanks Aqua4U! I hope Nov. 28 will be clear at your place so you can try for the comet. Will it be a Tranzit of Ison or Eclipse of Ison ? I wonder what the comet would look like thru a Hydrogen Alpha filter at perihelion? Somebody? It would be likely be invisible in an H-a filter since the filter removes so much light – enough to allow only the sun to be seen. Any comet would be hopelessly faint. So no chance then… I thought that the intensity of the reflected light might be bright enough? Are Hydrogen Alpha filters wavelength or saturation adjustable? What other solar filter(s) might be used for imaging during closest approach? There will be no transit or eclipse. ISON will never pass in front or go behind the sun from Earth’s perspective. It will only swing around it. Re: Ison, will it be visible from the equator? More specifically in Timor-Leste (country-125E 8S)? You are giving very dangerous advice here. Looking close to the Sun with the Sun only blocked by a roof-top or power pole?…. The second the Sun appears from behind the pole etc. your eyes are toast. You may be all in awe about the comet or are looking/being distracted..shift your position etc…and in the next fraction of a second you will have the Sun burning through your binocular. Seriously I can’t believe you posted this. If the sun is carefully covered by a rooftop, pole, etc. one can safely search the sky near the sun exercising great caution. The key is to make sure the sun is ALWAYS covered. Yes, it’s possible to get a quick glance for a split second of sunlight. If you think about it, we’ve all experienced this on occasion when looking up to check the weather, etc. and the sun crosses our field of vision. By no means should anyone STARE at the sun. The sun gives warning through its incredible brilliance – if you’re searching with naked eye or binoculars and you see the start of flaring in your field of vision, change your position to keep the sun covered. That’s what I’ve done for years both in hunting the occasional sungrazing comet, tracking the planets Venus and Mercury as well as taking photos of pollen, halos and coronae. Those 4 with the time on them … show how huge it really is and its only going to be closer as it rockets around the sun back, 40 million miles closer if I am not mistaken. Once is passes perihelion the comet will be briefly visible in morning twilight for a few days from your location. It’s much better positioned for observers in the northern hemisphere.